If you are doing this craft for a party, you may wish to pre-do up to Step 3. CLICK HERE to see a full sized photo of the craft. Close the photo window when done viewing. Cover the kleenex box with black construction paper (all sides). Use enough glue that when we slit open the top the paper will stick. Using sharp scissors, have an adult cut around 3 sides of the kleenex box, about an inch from the top (so the treasure chest opens). You will need to bend back the cardboard on the remaining, attached side so the chest opens and closes nicely. Now comes the fun part! Print out the template of choice. 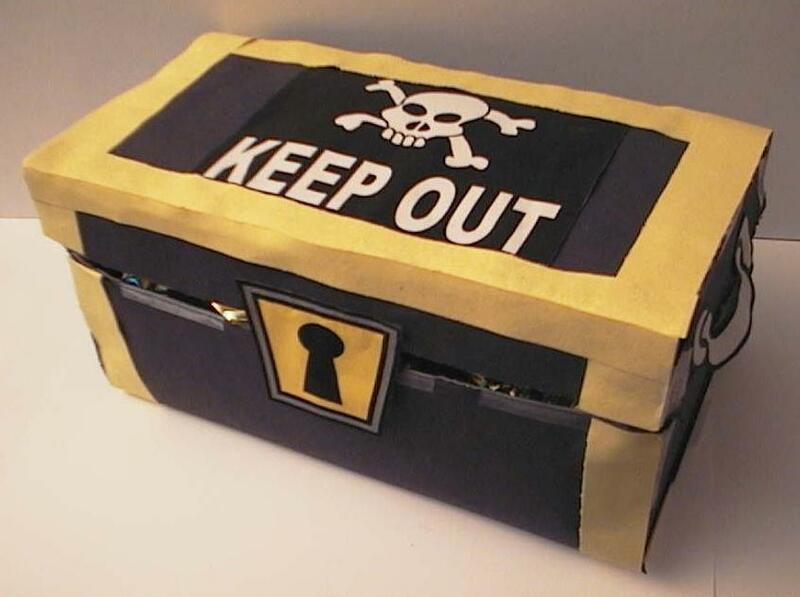 Cut 1/2 inch strips from yellow construction paper and glue them to all the edges of the treasure chest. Glue the handles onto the sides of the chest. Optional: Print the key template to have a key for your treasure chest. You may wish to glue the template to some cardboard before your cut it out to make it more durable. Thanks so much to Tamara and William for sharing this template with us. William figured that you can't have a treasure chest without a key so Tamara made him one and forwarded the templates to us! Thanks to Vickie for sharing her idea! We are going on vacation and we get small toys and beach things and put in a box. Last time the men went out at night and dug a place and buried it in the sand and the boys had such fun finding the treasure map (complete with Bible verse so they will find the real treasure) and finding the X marked in the sand and digging up the 'treasure'. We put in extra stuff for the other children who come around. Thanks to Caryn for sharing her alternative! For the pirate chest, we used an old diaper wipe box and double-side-taped on the templates - very simple for a 4-year-old!